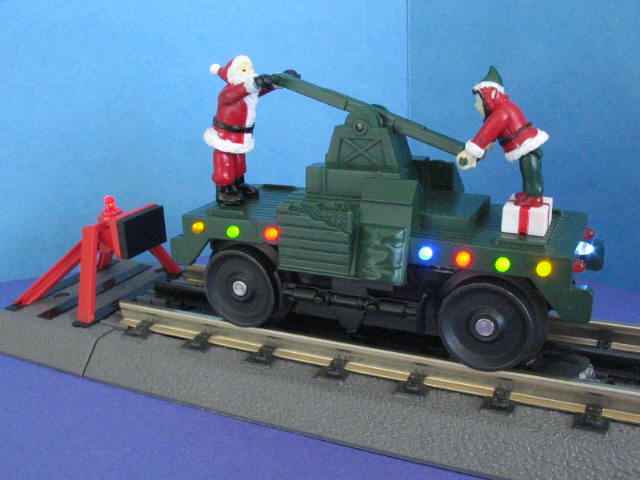 Here's the MTH Santa and Helper handcar modified with 3mm LEDs for directional headlights, tail-brake lights, and flashing holiday running lights. I removed the bump-and-go mechanical switch which reverses the voltage to the DC motor as Santa and helper did not appreciate the violent braking and resulting whiplash required to flip the switch. Instead, magnets on the track bed signal the truck to switch direction and the car decelerates (red tail lights brighten when braking), stops, reverses, then accelerates. The guts are fairly involved as DIY hobbyist projects go requiring programming of a microchip and fabrication of a circuit board to cram in all the parts. 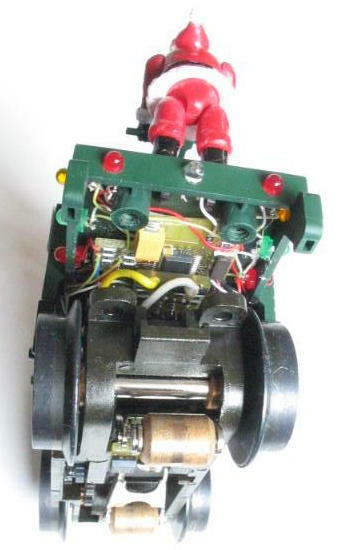 The handcar out-of-box applies rectified track voltage direct to the DC motor. The gearing required what I considered excessive speed to keep it from stalling as the pumping mechanism goes thru its cycle so I added speed control to keep it running at prototypical speeds. DC power is supplied to the track with a wall adapter. Any chance you could post a wiring schematic?